Listen Technologies, a leading provider of assistive listening systems for 20 years, has announced the launch of Listen EVERYWHERE, its new and improved Wi-Fi product. Listen EVERYWHERE is the latest in the evolution of Listen Technologies Wi-Fi products. It replaces Audio Everywhere and features upgraded hardware, a streamlined finish and a new server with professional audio outputs. Listen EVERYWHERE offers high-quality audio streaming and enables exceptional personal listening experiences in any venue. The professional-grade system with proprietary Listen Technologies hardware is easy to add to a venue’s existing wireless network and can accommodate thousands of users and over 50 channels. 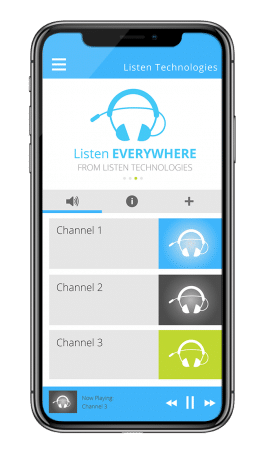 In venues featuring Listen EVERYWHERE hardware, patrons and guests can experience wireless audio streamed directly to iOS and Android smart phones and tablets via a free downloadable app. The app can be customized to promote a venue’s brand and further enhance the user experience. When patrons and guests open the app, they will see the venue’s unique welcome message. Venues can upload ads, coupons and special promotions as well as links to menus, class notes, meeting agendas and other content. Custom labels and logos make it easy for users to find their preferred audio channels. Listen EVERYWHERE already has earned industry recognition. While the product was in beta testing, industry trade magazine CE Pro, in conjunction with sister sites Commercial Integrator and Security Sales & Integration, recognized Listen EVERYWHERE with an Internet of Things (IoT) Award. Winners were selected based on technological advancement, ability to integrate with other products, value and end-user and integrator benefits. Listen EVERYWHERE is available now and extends Listen Technologies’ suite of personal listening solutions. Other Listen Technologies solutions designed to help people hear more clearly in challenging audio environments include ListenIR, ListenRF, ListenTALK and ListenLOOP. A free upgrade is available for Audio Everywhere users to get their servers on the latest Listen EVERYWHERE software and cloud service. More information about Listen EVERYWHERE is available at www.listeneverywhere.com.